As we close off 2016 and reflect upon the year, we also try to look ahead into 2017 hoping that everything will be good in the digital space. For the record, I’m not someone who is an expert in spotting trends, but these are some things I feel will make an impact in the digital landscape in the coming year. Chatbots are starting to gain some momentum among brands, especially those who manage customer service. The aim chat-bots is to free up the resource needed when answering day-to-day FAQs through automation when it comes to providing troubleshooting matters. However, chat-bots are still at an infancy stage. They still lack the “human touch” in terms of being able to communicate the same message differently to different audiences and they also can’t distinguish sarcasm as well. But I have a feeling that in 2017 more and more brands will start to explore and experiment with chat-bots and how it can help customer service. We all know by now the importance of data and the overused term “big data”. Often than not, marketers are only scratching the surface of how they can use all that collected data. But the more we dwell deeper into all that data and complex analytics, we hope to derive cognitive insights into helping us understand and predict user behavior. This would then benefit marketers in making better decisions during campaign planning and targeting of relevant messages more efficiently. 2017 will see more brands and companies relying on data and analytics to drive their businesses. Virtual Reality (VR) and Augmented Reality (AR) have been around for quite a while. Companies like Layar, which allow brands to leverage its services to develop AR based engagement, have been around since 2010. However, 2016 saw the people at Niantic Labs (creators of Pokémon Go and Ingress) took AR to the next level, making Pokémon Go the most played game app ever. Meanwhile Mark Zuckerberg of Facebook gave the world a glimpse of how the future of Virtual Reality will look like during their Oculus Connect event back in October. Perhaps these 2 milestones will set the tone on what is to come in 2017 in both AR and VR worlds. It’s not very uncommon now to see brands leveraging on 360 videos and live streaming of events on Facebook to promote brand messages. But I feel the adoption in emerging markets as well as smaller brands are slow because of the higher production cost needed for the equipment to create these videos. But as we move into 2017 however, I get a feeling that more of these equipment will be available at a more affordable prices (price reduction due to higher demand). Basic equipment that allows you to create 360 videos are now made available and affordable via crowdfunding sites such as Indiegogo and Kickstarter. 2016 was the year that “Fake news” made the news. Facebook was also accused of promoting fake news which has influenced the outcome of the US presidential election. However, Mark Zuckerberg has pledge to develop tools to combat fake news. In 2017, this would definitely impact what people think is a credible new source or otherwise. I feel that this would also have an impact on brands embarking on branded content or content association strategy. An interesting article on reddit.com talks about exactly how click-bait type article also co-relates with fake news. Is it that hard to believe that in future, you may only have 5 seconds to market to your consumers on YouTube or any video platform for that matter? When I say video platform, these include Facebook, Instagram, Vine, Twitter and many others. Let me explain why so.In a study done by Microsoft, the average attention span on ads dropped from 12 seconds to 9 seconds since the 2000’s. But one may argue, that is because in the past (pre-2000s), consumers were less exposed to ad clutter and had slower internet connection speeds, thus spending longer time to consume content. Today, advertisers need to compete for attention on a space that is cluttered with ads even on video platforms, which makes the consumers prone to ad blindness or even annoyance to a certain degree, resulting in them skipping or closing ads all together the moment they see one popping up. My 3 year old son is the best example. He presses the “Skip Ad” button on Youtube, if a pre-roll video ad is not interesting enough for him. Hence in future, the first 5 seconds is probably the most crucial to your future consumers, the Generation Alpha. The last thing anyone would like is to see something irrelevant being showed to them. It’s not only annoying, it’s also time wasting. This is where your ads have to be targeted and targeted well. Taking my son as an example, he skips ads that doesn’t resonate with him like a shampoo ad, but will watch the whole video if it’s something he can relate to like a Hot Wheels toy ad. The point here is, consumers will skip your ads regardless, if the content of the first 5 seconds is not something relevant to them. Yes, targeting is important, but it’s also equally important to make the first 5 seconds of your ad count. The same rule applies if you’re developing display type ads. Remember to be relevant to your target, otherwise it will be closed or skipped. While we talk about the importance of the first 5 seconds of your video ad, the general rule of online video ads is not to have it too long. No one is going to sit and watch a 10 minutes video about your company products or services unless they are made or told in an interesting way. Even that, 10 minutes is way too long these days (remember, users only have an average of 9 seconds attention span). Ideally an online video ad should be no more than 15-20 seconds and a strong call to action to lead them to a page for them to get more information, given that you can only say so much in 20 seconds. The key here is the first 5 seconds of what your user sees in that video. It will either make them stay on, or make them leave. We need to be mindful that putting a video ad on YouTube and Facebook are very different in terms of how they are presented. YouTube plays ads at the start of a video (pre-roll) and in the middle of a longer video (mid-roll), and users can usually choose to skip the ads after 5 seconds. Videos on Facebook on the other hand are presented in a person’s news feed. By default, Facebook auto-play the video without sound, unless the user changes the setting to disable “auto-play”. I read somewhere that there is still a large amount of Facebook users still have “auto-play” turned on (something like 65%) as they don’t know how to go about turning it off. Which means on Facebook, your ads has technically less than 5 seconds to get someone’s attention while they are scrolling through their news feed. And not to mention you got to do it without the aid of sound! Sounds insane isn’t it? In one study of Facebook video ads, 41 percent of videos were basically meaningless without sound. Now imagine putting up that 10-minute long corporate video as a Facebook ad. Not such a good idea now isn’t it? One way to reduce someone missing your video ad is to have an interesting caption that will act as a hook to get users interested enough to pause midway through scrolling on their news feed, read the copy, and then click to watch the video. According to wired.com, Facebook says that including captions on video ads increases the amount of time people spend watching them. For ad and brand recall, it is also recommended that advertisers show captions, logos, and products in ads, especially in the first few seconds. The digital landscape is fragmented. VERY fragmented. There are many components and parties that rely on each other to make things work. Creative agencies, media agencies, publishers, ad serving, tracking, etc. In fact, it’s so fragmented, that there are providers that provide overlapping services to one another, and it can be totally confusing for someone to grasp what each service provider really does. 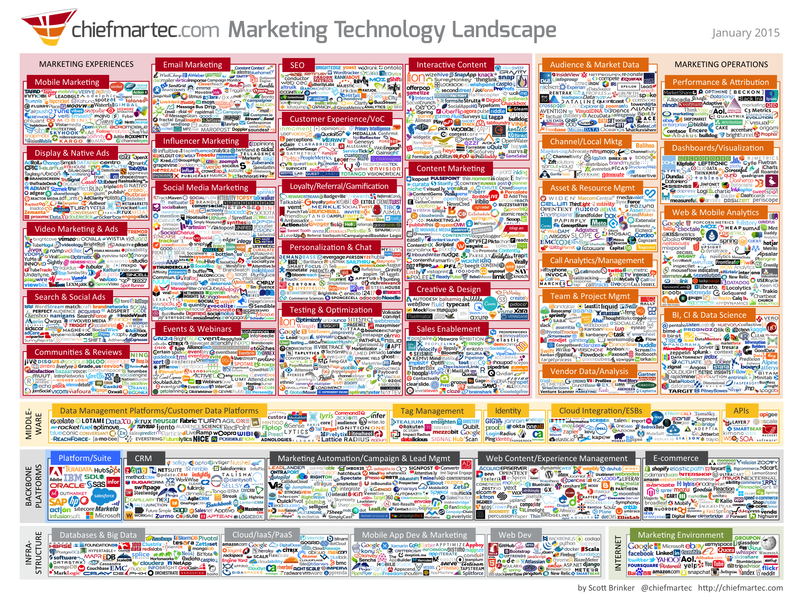 Just to give you an idea, here is an image from chiefmartec.com on the marketing technology landscape. Believe me, I sometimes get confused as well after looking at this chart. For brands who want to invest in digital after seeing this, you can understand why there is confusion and doubt. Digital jargons are scary. There are so many metrics and measurements that are being used to the point that brands (and also agencies) sometimes do not really know what metrics they should be looking at. It doesn’t help that every year, that jargon list grows. Brand owners who do not know how to justify these metrics to stakeholders would tend to stay away, hence playing it safe by only investing to what they know (i.e. traditional media) – they fear the unknown. Again, the best way is to keep abreast with what’s happening in the digital marketing world. Agencies should play a bigger role here by educating brands through workshops and training, so that brands are constantly updated and know how to look at these metrics and make sense of it. In this case, it’s more like “I’m afraid of what I will know”. For digital, (almost) everything is trackable. Hence, for a brand owner, it could be something that may work against them. I once asked a client why they did not want to run a particular campaign on digital. They said it was too technical for them, and everything is trackable to which, should the campaign not do well, it would be hard for them to “hide” the evidence and justify to stakeholders! But then I asked, why do you think it would fail in the first place, given we have tools that can optimize the campaign? What if you can show your bosses that you can actually track and show proof of success? To which they became interested and asked me to explain more. The main thing here was more the case of the client not knowing the benefits of investing in digital. All it takes is a little education and effort to try it out to be able to understand its benefits. This is kind of a chicken and egg situation. Digital investments can initially cost a lot to start. With cost of creative development, cost of media, setting up of platforms, re-occurring cost for services, etc., you could also see why brands tend to sway away from this. However, most of these are initial one-time setup costs. For example, if you want to run multiple creative ads online using display advertising, you would initially have to pay a hefty fee for the design of dynamic ad templates. But once those dynamic ad templates are created, it doesn’t cost much to have multiple ads running off those templates. You could then update these creative in almost real-time whenever necessary. Which other traditional medium lets you do that? Similar to having a mobile application or building a website, the initial setup does seem expensive, but in the long run, the cost will justify the investment if you do it right. Facebook Canvas: What does this mean for other mobile rich media ads? Last week, Facebook announced the launch of its new ad unit called Canvas, a full screened rich media ad unit capable of delivering high impact experience on mobile. While many say that it’s cool and what not, I say “It’s about time, Facebook!” This is not exactly something new if you’ve dabbled into creating mobile rich media ads before. Mobile rich media ads have been around for at least the past 5 years or so, or when HTML5 was first introduced. It enables ads to be interactive and engaging with the use of video and multiple functions. To explain this to the layman, I normally say it’s an ad unit that expands full screen to show a micro-site of your brand. It is used to tell a story of your brand / product / service by creating different pages and different functions to drive home the points. To be honest, I think both have its own strengths and weaknesses. The standard mobile rich media ads are design to run across mobile ad networks (which are outside of Facebook), meaning it can reach users on other long-tail sites other than Facebook. This works well if you want to reach an audience who are not necessarily on Facebook (think China). The key challenge for ad networks are of course the visibility of your ads to the audience, since most are running on bidding inventory and limited screen real estate. On the other hand, Facebook Canvas is native to the app to provide the user a seamless experience when browsing through the timeline. Facebook of course have one major advantage….data. When they launched Facebook Reactions, its primary goal was to gather richer data from users (You can read more about it here). This means the Facebook Canvas ads are able to be micro targeted based on Facebook’s already rich data filters. Not to mentioned, how targeted the ad can be if you include your own set of data through Custom Audiences. I would say, rich media mobile ads still plays an important role beyond Facebook. I’ve seen mobile rich media ads that can take advantage of mobile phone functions such as camera, gyroscope, voice functions and GPS to create a more personalized and engaging experience. I don’t think for now that Facebook Canvas is able to do that (or not yet at least). The main advantage that Facebook Canvas has is probably the richness of its targeting capabilities. So before you decide to jump on the band wagon of creating ads using Facebook Canvas, it’s important to ask what is its main objective. For me at least, Facebook Canvas works well with brands that has e-commerce presence (works well as it offloads mobile traffic on e-commerce sites), telling a brand story and brand building. These ads does not necessarily require a lot of interaction with the user, but yet informative enough with a strong call to action. If you want your ads to be more interactive and fun, then go for mobile rich media ads as it is able to leverage of mobile phone functionalities. End of the day, it also depends on where and who you want to reach out to. Is it better to hire in-house talent than rely on agencies? A very controversial topic, seeing that I spent more than half my working career in advertising and media agencies. Now that I’m part of a client side marketing team, I somewhat understand why clients are generally frustrated with their agencies which makes them not loyal to one agency which often result in calling for agency pitches every now and then. While agency teams rely on multiple clients to survive, it may be hard to get an agency team to only focus on your business. Admit it, even though agencies say they have “dedicated team(s)” to service the account, most agencies often assign more than 1 client account to any one person so that a resource is fully utilized during down times. While I’m not saying it’s wrong to do that, it also implies that the resource does not have full focus on a particular client’s business in order to fully provide valuable strategies and inputs. In order for agencies to fully understand a client’s business, it is sometimes necessary for them to also be involve in other parts of a client’s business, and not solely focused on Marketing alone. They have to understand how Sales, Marketing and Product departments work together as well in order to get a bigger picture of the overall business. This is somewhat how consulting firms such as IBM, Accenture and McKinsey operate and service their clients. They get to see a larger picture of organizational functions and processes in order to give better recommendations for a client. Sometimes it’s frustrating for a client because agencies do not understand the overall business. The key here is being able to give long term strategies to shape a brand, rather than just campaign ideas that just focuses on short-term gratification, even if it means driving sales and numbers (and awards). In order to do that, agencies need to see the bigger picture. One of the biggest factor of why a client would rather have in-house think tanks would be exactly this reason. Agencies requires the time to be briefed, come up with creative ideas, run through their strategist, copywriter, creative director, etc before they come back to you. On the other hand, if you have an in-house team, they would have already been briefed in daily meetings and thus would also able to give an almost immediate feedback to the team. Then comes the “what-if” situation of the agency’s proposal / idea not sitting well with the client. It then goes through the whole vicious cycle of “back to the drawing board” and again time taken to come back with a fresh proposal. Time taken to do this may vary of course, but agencies often feel the pressure and rush (hence all those late nights) in order to meet the client’s deadlines. In my years in agencies, I hardly (or maybe never) get the “go ahead” from clients on the first proposal. It’s 80% okay, and 20% of tweaks most of the time if you’re lucky. Again I feel that this turnaround time has a lot to do with how agencies work in sharing of key resources (creative person, strategist, account manager, etc) as most of them are working on more than one client account, which contributes to prolonged turnaround time. So is it all doom and gloom for agencies? Not for now. While most of the above are reasons to consider setting up an internal team, agencies do also offer some value, especially if they are part of a large network. If the client’s business involves creating presence and impact outside of the local market, this is where agency with global networks thrive. Clients get to leverage on getting insights and service from an agency that has a local setup in that particular country to better understand the market. Agencies also heavily invest in tools and research to come up with proposals and insights. This is an area most clients won’t have the capability (or time) to do. Tools that help do predictive modelling, media planning or even to budget media spends are expensive to deploy on the client’s end that does not justify being purchased in most cases, simply because it’s not the client’s main nature of business. With the use of these tools, also come another set of talents which client teams do not have expertise on. To hire in-house or not? In summary, I feel it really depends on how much control a client wants over their brand. If you look at companies like AirAsia, Proctor & Gamble and Unilever in some markets, they have already started to develop in-house capabilities and teams. P&G invests in their own digital platforms and teams in order to have some control of how they want to position the brand(s), while relying less on agencies compared to a few years ago. I feel that agencies need to give more valuable capabilities in order to stay relevant, something that clients can’t emulate even with an in-house team. It can be products, platform or even services, so that clients need agencies as much as agencies need clients. Being in the industry for some time, I've came across different businesses that wants to start a mobile ad campaign, because they say it's the most effective way to reach their consumers, since almost everyone nowadays has a mobile device. When further asked, what is it that they want to achieve in doing a mobile campaign, most say, "I just have a new product launch and I want people to know about it", or "I want to drive them to my company website for sign-ups and get leads". While you can do both using mobile ads, there are also some effective ways on how we can deliver the message and drive quality traffic to be able to achieve those objectives. This the single most important rule. If your site isn't optimized for mobile, DON'T use mobile ads to drive them there. Nobody likes to zoom in and scroll left to right to read information, therefore your landing page needs to be either adaptive or responsive to cater to various screen sizes. Also, when the mobile user clicks on a mobile ad, they expect bite-sized information, and if there is a form it should not be more than 4 fields. If you don't have one, be prepared for high drop-offs and bounce rates. Mobile devices have relatively smaller screens compared to desktops. Hence, you wouldn't want the mobile user to squint their eyes trying to read your message or identify your brand. Using larger ad units also has an impact of click-through rates as the table below clearly shows. you should look beyond just CTR% when you want to measure a campaign's success due to these accidental clicks. Studies will show that most users on mobile have short attention span and want quick information and not long a winded type article explaining on how a certain product works. Therefore, information and messages should be short and straight to the point with a clear call to action. Bear in mind that real estate on mobile ads are also limited. Rich media banners (or banners running on HTML5), can deliver high engagements at the same time fulfilling points #2 and #4 above. Most rich media banners starts off as a simple banner, but with clicked, it expands to a full screened mini-site that allows more information to be displayed, as well as enable videos and different interactions using the mobile device's functionalities (camera, gyroscope, GPS, etc). SMS or Short Messaging Service, has been one of the longest and often used (and sometimes overused) form of mobile communication by both consumers and marketers. But, with the rise of mobile chat applications such as Whatsapp, Viber, WeChat, Skype, Line, and even Facebook Messenger, it's not really surprising that we see a decline in overall SMS usage here in Malaysia. We are already seeing a decline of total SMS sent in Q2 2014 vs Q2 2015 in Malaysia (13,193 mil vs 6,855 mil) by about 48%. And the usage still seems to be in a downward trend in 2015 in Q1 (7,768 mil) vs Q2 (6,855 mil). That's a reduction of 10% usage in just one quarter alone! Source: Communication and Multimedia Pocket Book of Statistics, Q2 2015, MCMC Malaysia. The SMS usage numbers will only decline even further within these 2-3 years as more mobile chat applications become available, mobile data prices becomes more affordable and smartphone usage increases. However, one thing to note that while SMS usage is on the decline, it's still regarded as a more reliable form of messaging compared to chat applications. SMS is also available as a default to all mobile phones, while chat applications are still very fragmented in nature, meaning, not everyone are on the same chat platform or application as you. So whether SMS will still be around in the next few years remain to be seen, but the days of SMS are certainly numbered! 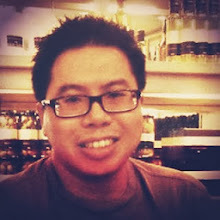 Nicholas is a digital media strategist who blogs mainly about the Internet, branding, social media and technology. Content you read here might not necessarily be true or right and are based strictly on the author's view and thoughts only. Copyright demonick 2010-2014. Simple theme. Theme images by gaffera. Powered by Blogger.